Everyone loves a good smoothie. Smoothies are a great way to get a quick meal in that will fill you up for a fair while. It’s also a handy way to take a meal with you on the go, especially if you are running out the door and near something to eat on the way to work/uni/school etc. The flavour and nutrient combos of smoothies are practically endless. Not to mention they have got to be the easiest things to make ever, chuck everything in a blender, and boom, you have a smoothie ready to go! One of my favourite go to smoothies is a simple one that incorporates three of my favourite foods: Chocolate, Banana, and Peanut Butter . It’s a perfectly balanced meal, with a third of the calories coming from each macronutrient. It also tastes divine! Chuck it all in a blender and blend until smooth… literally, that’s it! This smoothie is delicious by itself but also pairs well with a sprinkling of granola or rawnola over the top. 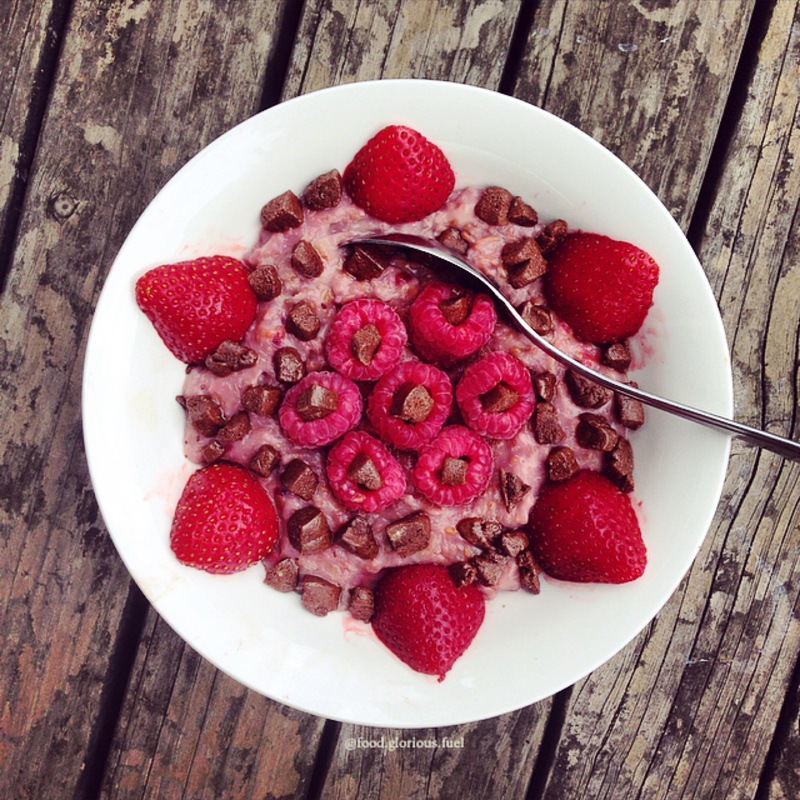 I often add some of my Chewy Chocolate Rawnola or Crunchy Chocolate Granola over the top to add a little crunch! I often have this smoothie before bed as a little late night dessert but also to help me get to sleep (there is nothing worse than being hungry whilst trying to get to sleep) and to keep me satiated throughout the night so I don’t wake up ravenous! If you make any of my other recipes, I would love to hear your feedback and see your creations. 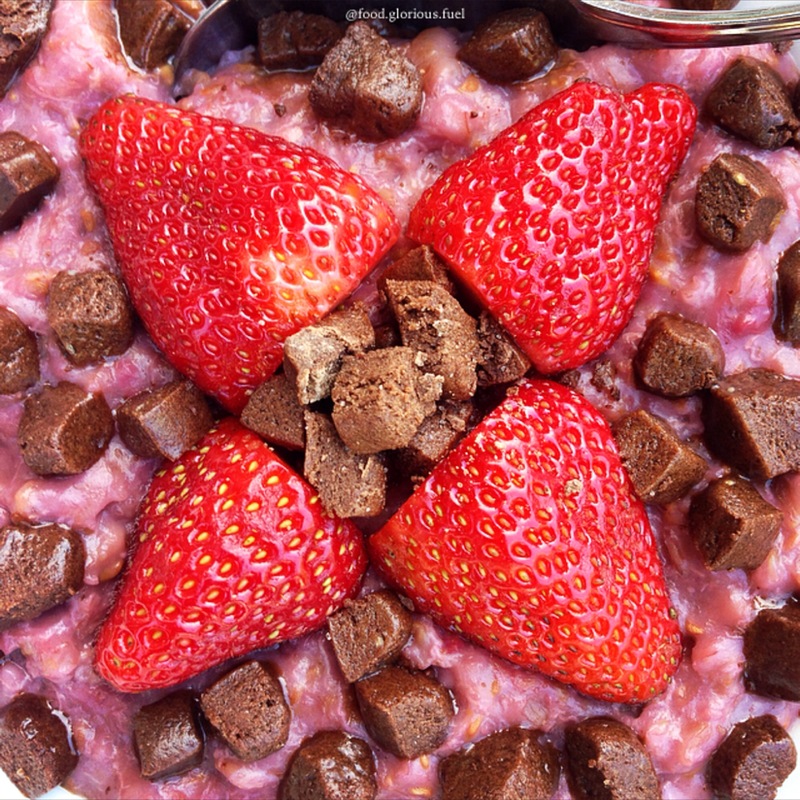 If you post to Instagram tag me @food.glorious.fuel and hashtag #foodgloriousfuel to share what you’ve made! Berries and coconut is a tried and tested combination, so I wanted to create a berry and coconut granola. Initially I attempted a mixed berry and coconut combo using raspberries, strawberries, blueberries and blackberries, but that unfortunately failed for a number of reasons. I went back to the drawing board and decided to simplify it to just raspberries and coconut and by tweaking a few things managed to come up with a winning recipe! 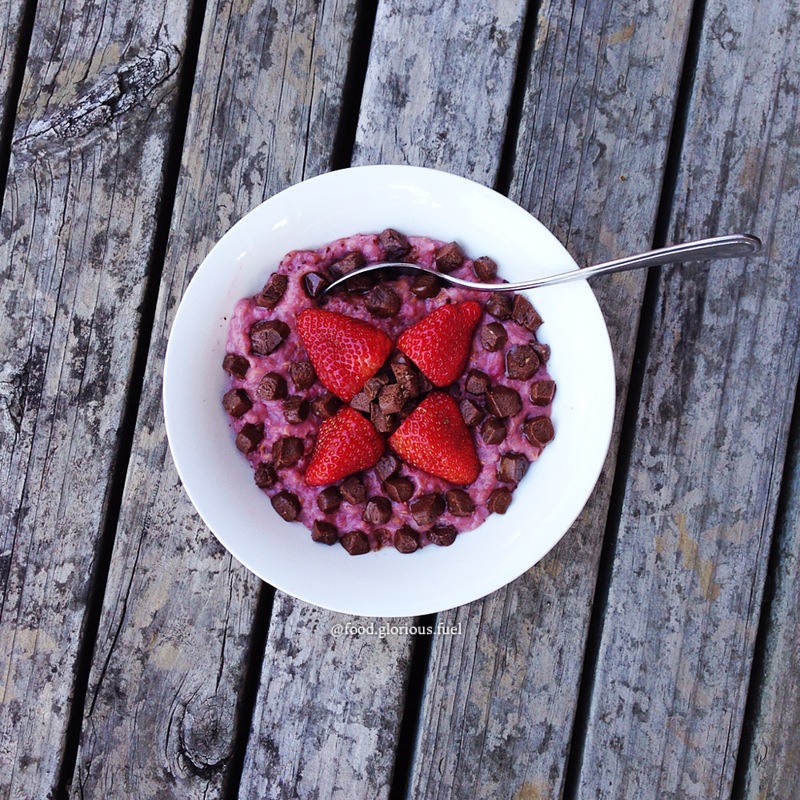 So here is my Raspberry Coconut Granola! I find the easiest way to open a coconut is to use a screwdriver and hammer. Poke out all three eyes by carefully hammering through the screwdriver and then drain the coconut water into a bowl through a sieve. Place the coconut in your hand with the eyes between your thumb and index finger and use the hammer to hit the middle of the coconut, rotating it on the axis of the eyes so that you end up hammering a straight line around the circumference of the middle of the coconut. Keep doing this and you will hear when the coconut starts to crack along this weakened line you have created. Keep hammering, this time more softly and carefully, until the coconut splits in two and then pull it apart with your hands. To get to the coconut flesh use a sharp knife to cut wedges into the coconut emanating from the center and use a flat head screwdriver to wedge between the coconut flesh and shell and leverage the meat out. The flesh will come out with a light brown thin skin on it, which is edible, but I choose to remove it with a vegetable peeler. Step 3: Into a large mixing bowl add the rolled oats, pecans, flax seed/linseed, sunflower kernels and salt, and combine thoroughly. Once combined add the crushed frozen raspberries and stir through. This granola is amazing by itself as a snack but I also love to use it to garnish smoothies, nice cream and yoghurt, as it adds a crunchy texture and extra goodness to really top off a meal! If you make any of my recipes, I would love to hear your feedback and see your creations. 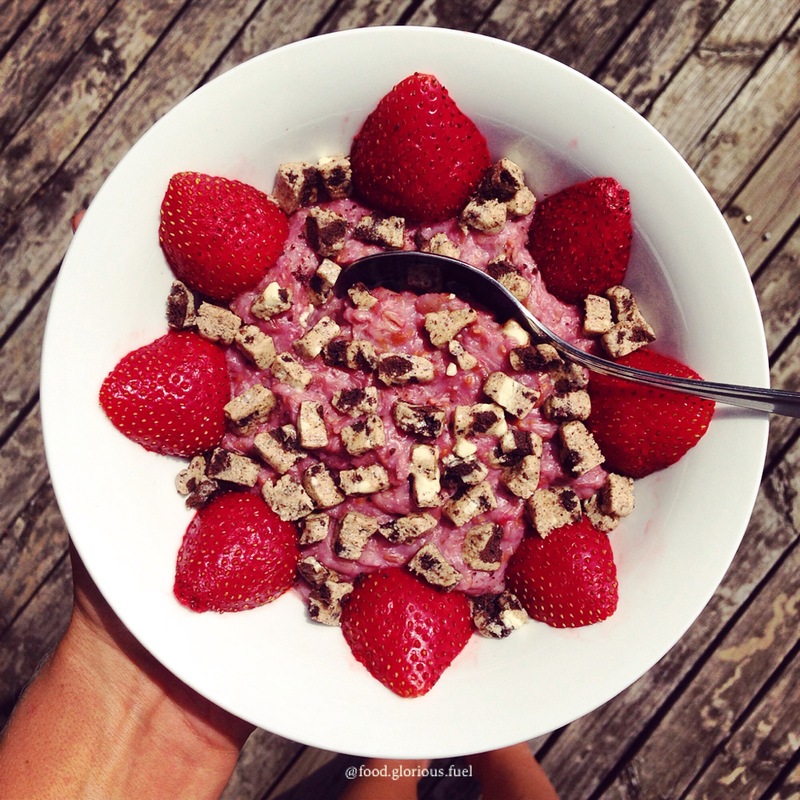 If you post to Instagram tag me @food.glorious.fuel and hashtag #foodgloriousfuel to share what you’ve made! What’s better than ice cream cake? How about HEALTHY ice cream cake? Yes? YES! What if I told you that you could create a layered two-flavoured healthy ice cream cake with only 6 ingredients that is raw as well as vegan? Well you can! Let me present to you my Raw Vegan Chocolate Raspberry Layered Nice Cream Cake! Step 4: Add the peanut butter near the middle of the food processor and then scrape down the sides (where the date paste will have stuck) and add the oats round the outside (this will help the mixture stop sticking to the sides). When the time comes to cut the cake use a large straight edge knife to cut through the nice cream layers and then swap to a smaller serrated knife to cut through the base. Store in the freezer and serve straight from the freezer, you don’t want it to melt whilst sitting out on a bench waiting to be served! It’s no secret I love Chobani Greek yoghurt, whether by itself or topped with fruit, granola, nuts, or anything else I fancy at the time. However I now incorporate it into my breakfast most mornings throughout the warmer half of the year by using it to make delicious overnight oats. The Chobani flavour range leads to that many (and more) possible overnight oats flavours, which makes for a simple and delicious breakfast that can be a different flavour every day of the week! The following are four of my favourites to date. Sometimes I eat my overnight oats as is, particularly if I am in a hurry, but more often then not I transfer the oats to a glass or bowl and add plenty of toppings. My toppings of choice are usually fresh or frozen berries, pomegranate, dried fruit, pieces of my Raw Vegan Chocolate Bark, or a Raw Vegan ‘Ice Magic’ (1/4 recipe for my Raw Vegan Chocolate Bark and I just spoon it onto my overnight oats and it ‘sets’ when it hits the cool oats). Everyone knows I love chocolate with a passion, and there is nothing better than being able to whip up a batch of home made chocolate whenever I feel like it at add whatever flavourings/toppings I’m in the mood for. This Raw Vegan Chocolate Bark is obviously raw and vegan, but also has no added sugar (unlike most store bought chocolate) as it uses rice malt syrup as the sweetener. The flavour options are endless and you can mix and match to your hearts content, as the base chocolate recipe is the same for all the barks. As for toppings/flavours you can add however much of whatever you want. You can make individual flavour barks or make any combination you fancy. Some of my favourite toppings are pomegranate, peanut, dried pineapple, coconut, hazelnut, and cranberry. Step 4: Carefully pick up the tray and slightly tip the tray forwards and backwards and then right and left to spread the chocolate (how much you tip it changes how thick the resulting bark is, tip it further for thinner back, and tip it less, or not at all, for thick bark). Step 8: Break the chocolate bark up into pieces by hand, how big you make the pieces, and how many pieces you make, is completely up to you. Store in an airtight containing in the fridge or freezer. You can eat your chocolate bark as is, or use it as a garnish on things like smoothies, overnight oats, ice cream/nice cream, or even melt it into a bowl of warm porridge. It also makes a lovely gift and can be made to look rather fancy with a simple clear cellophane bag and some ribbon. The macros are hard to figure out as it depends on what toppings you use and how much of them, and also as the bark pieces aren’t a uniform shape or size only an estimate of the macros per serving can be guessed from the overall macros of the bark. Therefore i will list the macros for the entire plain chocolate bark that the recipe makes and you will need to adjust them by adding the macros of the toppings you use. If you make this, or any of my other recipes, I would love to hear your feedback and see your creations. If you post to Instagram tag me @food.glorious.fuel and hashtag #foodgloriousfuel so that I can see what you have made! This year for Christmas I am once again giving a selection of my home made foods as gifts to certain people and I always enjoy experimenting with a few new ‘festive’ recipes each time around. This year I wanted to put a new twist on a common turkey stuffing combination of Cranberry and Orange to make a sweet and nicely tangy granola. It worked out perfectly with the finished granola having the satisfying zestiness you want a citrus flavoured food to give and also the sweet tartness expected from cranberries. Step 3: To a large mixing bowl add the oats and the zest and mix well, there will be a little bit of moisture with the zest which the oats will absorb easily. Step 4: Add the pecans, flaxseed/linseed, salt and cranberries. Stir thoroughly to mix all ingredients. Step 9: Replace in the oven for a further 15 minutes (you will be able to smell when it is ready, it will also turn golden). Step 11: Once cooled transfer to an air tight container, and enjoy! It’s no secret that I love porridge, or that I love raspberries, so I’m sure it’s not surprising that I love to combine the two. One of the reasons I love porridge is because it is so versatile, the flavour combinations are literally endless. 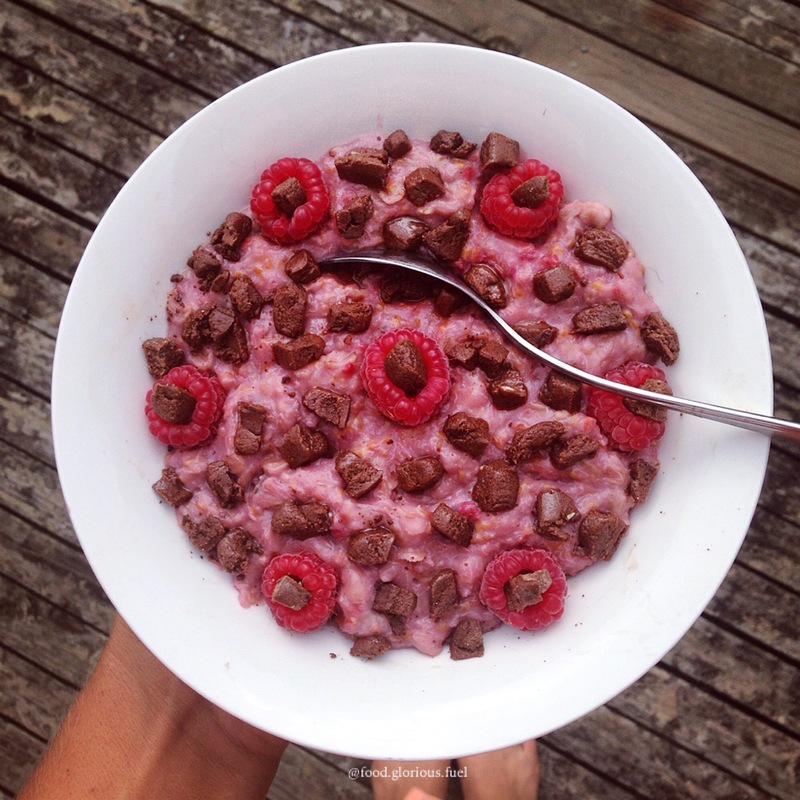 It was very simple to turn my basic, plain porridge recipe into one for raspberry porridge, I literally just add frozen raspberries! Nothing could be easier! Step 6: Remove from microwave and stir. If you make this, or any of my other recipes, I would love to hear your feedback and see your creations in the comments section below and on Instagram. If you post to Instagram tag me @food.glorious.fuel in the post and photo, and hashtag #foodgloriousfuel so that I can see what you have made!